The third helming gig for editor-turned-director Hal Ashby, whose two previous films The Landlord (1970) and Harold and Maude (1971) were considered quirky and didn’t land in bankrolling studio executives’ comfort zones, the acclaimed 1973 drama-comedy The Last Detail stars Jack Nicholson (Five Easy Pieces), Otis Young and Randy Quaid (The Long Riders). Written by Nicholson’s friend Robert Towne (Chinatown) who adapted the novel by Darryl Ponicsan, The Last Detail offers the story of two Navy “swabbies” (Nicholson and Young) who are ordered to bring a young sad-sack recruit to naval prison but decide to show him one last good time along the way. 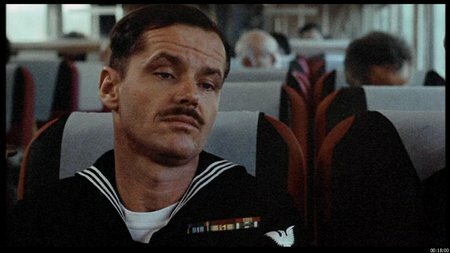 Considered one of the stand-out works of ’70s American cinema, the film offers one of Nicholson’s finest performances—a Cannes Film Festival Best Actor award-winner wherein he shines as a hard-drinking, foul-mouthed grunt named Buddusky. The Last Detail also features supporting turns by Carol Kane (Hester Street), Clifton James (Juggernaut), Nancy Allen (Dressed to Kill) and Michael Moriarty (Report to the Commissioner). As supplier Twilight Time prints up only 3,000 copies of each title, be sure to keep on the Twilight Time site or that of distributor Screen Archives for the Jan. 6 prebook date!